WHERE CAN I GET A VIOLIN TO START LESSONS? In my opinion, renting first is usually the best for children, because there are different violin sizes and as children grow, they grow out of their violin. But some parents like to buy right away figuring they will save money, by not renting. However, music stores like Monaco’s Violin Shop in Getzville NY offer deals. Monaco’s currently has a deal if you are renting a violin, they put the your rental payments toward the purchase of a new violin in the future. There is a one year cap on the payment deduction, but it does save money and takes a good 100 some dollars off the purchase of a violin when you are ready to buy. I took advantage of this offer when I was in Middle School (rather, my parents did) when I bought my violin from Monacos. When the student is in the fifth or sixth grade, and sized for a full size violin (4/4), then I would suggest that is the best time to stop renting and start looking to purchase a (full size) violin. 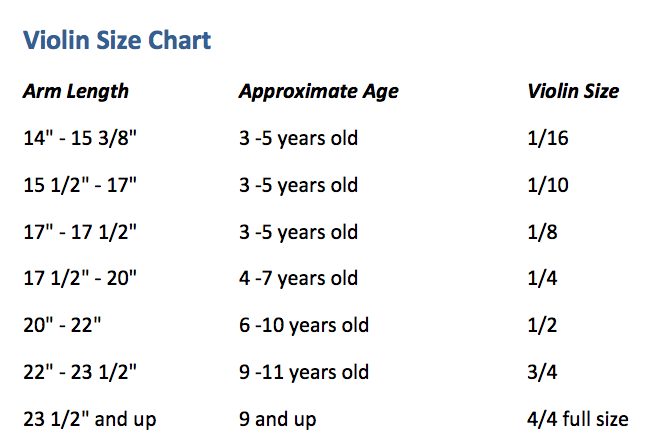 This chart is good, but Please, take advantage of your violin teacher or your local music store staff when sizing choosing the right size violin for your child! Both tuning pegs and fine tuners tune the Violin. The Tuning pegs are located at the top of the violin under the scroll and are made of wood. The fine tuners are near the base of the violin and are metal. Most (beginner) violins have four fine tuners and all violins always have four tuning pegs. To tune: Turn the pegs, or fine tuners very gently, to the right or to the left…..usually left is loose and right is tight. The looser the string is the lower it sounds, the tighter the string is the higher the sound is. Be very careful tuning…I would suggest if you are not familiar with tuning a violin, or your child is a beginner, to bring it to your local music store and have them tune it OR bring to the students’ teacher. Email me and set up a lesson!